Technical Pro Dual 10" Powered 1500w Bluetooth Speaker w/USB/SD/LED+Wireless Mic . 155 watts RMS @ 1.0% THD @ 8 ohms. 1500 watts peak power. Includes built-in amplifier, wireless microphone. Built-in amplifier with power barewire output. Line Inputs: Bluetooth, RCA (2), AUX (1/8"), USB, SD & FM. 1/4'' microphone input with separate echo & volume controls. 1/4'' guitar input with separate volume controls. FM tuner with auto scan. Woofer: Two 10'' LED woofers, 1.375" voice coil, 30 oz. magnet. LED Woofer Demo, On & Off settings. Tweeter: Two piezo. USB & SD Card maximum size: 64GB. Plays .mp3, .wav, .wma files from USB drives and SD Cards. LED display for USB / SD Card inputs. Repeat playback on USB / SD Card inputs. Bluetooth® compatibility allows for wireless connection to any A2DP stereo. Bluetooth device. Features Bluetooth v3.0 with EDR Range: 30 Feet. Bass and treble controls. Built-in 5 band equalizer with Direct EQ Function (equalization points: 125Hz, 50Hz, 1KHz, 4KHz, 10KHz). Frequency Response: 20Hz-20KHz. Sensitivity: 90 +/-2dB. Impedance: 4 ohms. 2 Integral carry handles. Wireless signal high band. Frequency stability: ±0.005%. Maximum deviation range: ±25kHz with limiting compressor. 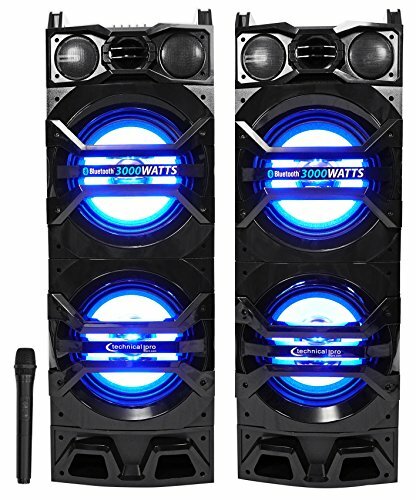 Service area: 100 ft.
Technical Pro Dual 10" Passive 1500w DJ Speaker w/LED Lights + Titanium Tweeter. 155 watts RMS @ 1.0% THD @ 8 ohms. 1500 watts peak power. Bare Wire Inputs. LED Input RCA. Woofer: Two 10'' LED woofers, 1.375" voice coil, 30 oz. magnet. LED Woofer Demo, On & Off settings. Tweeter: Two Harmonic LED 1" voice coil, 10 oz. magnet titanium driver. Frequency Response: 20Hz-20KHz. Sensitivity: 90 +/-2dB. Impedance: 4 ohms. 2 Integral carry handles. Unit Weight(lbs): 66. Voltage: 110/220v. Dimensions: 12.4" L x 9.4" W x 33.4" H. Giftbox: 15.75 L x 14.65 W x 39.76 H.